Safe XP improves system performance and makes your Windows to run faster, more secure and more stable. Suitable for beginners and experts. Great program, been using it for quite some time, a staple for me. a more safe program to use. I can confirm what httpd.confused stated in the previous review. I was initially pleased with the program when it was first released, but used it very conservatively. The more I changed settings, the more jacked up my machine became. Once, on a friend's PC, I made a single change: "Remove Shared Folders", and that worked, but it screwed up a couple of other things in the process. Things DO get changed that you aren't even aware of, some of which took me a while to discover. Safer, in my opinion, to find out the specific registry edits needed to achieve the desired system changes. (1) Safe XP creates any missing registry values, and unless you explicitly set every option shown on the main window, it sets those values to the setting that leaves then enabled. For example, I had my "Help and Support" service set to Manual, because that is the best setting, as far as I'm concerned. I didn't enable the option in Safe XP to disable that service, so Safe XP set it to Automatic! This poor design can also have the exact *opposite* effect as what is intended--it can leave you *less* secure. Suppose you don't have a particular registry value, but upon seeing the lack of that value, Windows uses a secure default. However, Safe XP comes along, and creates the registry value, and sets it to the opposite of the default. Unless you know that Safe XP is too stupid to know about the concept of "no setting exists--using defaults", you'd be screwed. (2) It makes many changes to the registry which are not reflected in the main window. I guess they think everyone is too stupid to comprehend the implications, and that they just know better. Well, their poor application design left me with a "Your Computer" security zone, on top of the "My Computer" zone I already had there. In short, Safe XP might be helpful to novices, or people who just can't be bothered doing these things carefully by hand. But for those of us who have already reviewed many points of security, it's a poorly-designed total kludge that will mess everything up. Nice tool, but a lot of functions. JennaJames, that's the stupidest post I've read all year! Obviously a useless program. Windows only runs at one speed and any claim to speed it up is in error. Dead link that leads practically to nowhere! Nice utility keeps getting better, love GameXP too. Thank you! 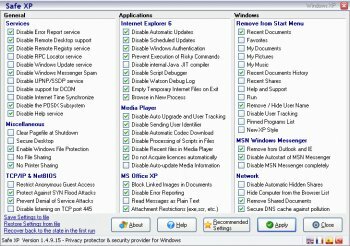 Great program to enhance XP security. It protects you from a lot of security holes than Microsoft haven't fixed. The interface is extremely simple and clear, and is translated. You can save your settings before any changes, and restore them later.